Sold in a four piece box. Peppermint just seems to "go" with the holidays. 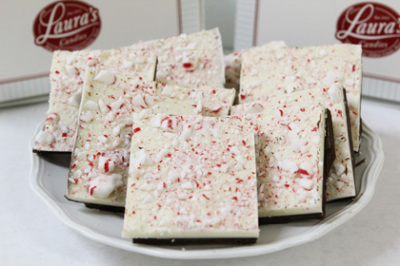 Enjoy Laura's delicious peppermint bark; a layer of peppermint dark chocolate, peppermint white chocolate, and topped with crushed peppermint candy. Get this item while you can! Laura's Holiday Peppermint Bark is a seasonal item, available only from November 1 - February 1 of each year. Sold in 4-piece boxes. Each box contains approximately 3/4 of a pound of Holiday Peppermint Bark.